I try to cook seasonally, but this just sounded perfectly warm and delicious on a chilly night when we were both trying to kick a lingering cold. I have made this recipe once before when I lived in Dallas, and thought about it last week. I'm sure it's amazing using end of summer tomatoes, basil and late summer corn, but it's still pretty tasty in the winter on a chilly night. To make the polenta, bring water to a boil and season with salt. Slowly pour polenta into boiling water while whisking constantly. Cook for 3 to 5 minutes, according to the package instructions. Stir in cheeses. Pour polenta into a greased baking dish and allow to cool. This can be done a day or two ahead of time. Cut polenta into individual pieces and reheat in a nonstick skillet. For this recipe, I prefer the contrasting texture of this polenta preparation rather than the softer texture poured straight out of the pot. Plus, one less thing to cook for a week night meal. Preheat the oven to 350°. Season chicken with salt and pepper and bake until just done... about 30-45 minutes. While the chicken is cooking, cook the pancetta in a large skillet until crispy. Remove and drain on paper towels. In that same pan, melt the butter and add flour. Whisk the roux for about 2-3 minutes while the raw flour taste bubbles away. Slowly whisk in 1¼ cups milk. Bring to a boil and then reduce to a slow simmer until it thickens, about 5 minutes. Add frozen corn and tomatoes, reduce heat to warm and cover. When the chicken is done, shred it into bite size pieces and stir it into creamed corn mixture. 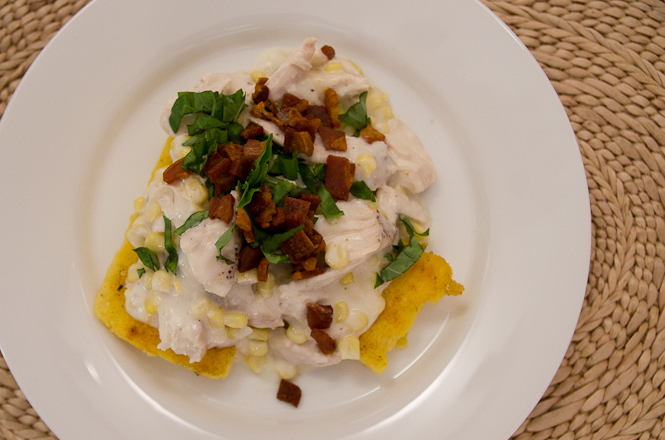 Assemble-- polenta squares, topped with creamed chicken and corn, sprinkle with pancetta and top with fresh basil.